Yes! Show me how to draft my pant block! Yes! send me a dvd to draft my pant block! This is the best option if your internet access isn't reliable. $24.97 USD plus shipping. Purchase the Dress and Pant Block Tutorials together and SAVE !! Yes! 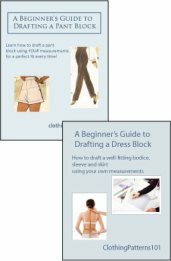 Help me draft my pant and dress blocks! Yes! Send me the Pant and Dress Block DVDs! Why is it so Hard to Find Pants that Fit? Women come in all shapes, sizes, and styles. So do pants. Shorts, ankle-length, wide-leg, tapered leg - the variations are almost endless. But none of them look good unless they fit well. Unless they fit YOU. At 5'2" and a size 16, I know all too well that "off the rack" pants don't fit every woman. I have to alter ever pair I buy. Finding pants that fit your figure is hard. MAKING them fit your figure is relatively easy! Making pants, and getting them to fit properly, can be intimidating. But it doesn't have to be. With a basic pant block, drafted to your measurements, you'll have the basis for pants of any style you like - and they'll all fit perfectly, with no alterations! And drafting the block isn't as hard as you think. 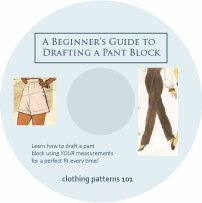 In fact, drafting a pant block is easier than drafting a dress! There is no sleeve, bodice, or skirt - just a front and back leg pattern. And there are fewer measurements to take! When you draft a block from your own measurements, you'll get a better fit than using a commercial fitting pattern. You'll have fewer fit corrections to deal with when fitting your block. And with a well-fitting pant block, you'll have a good, basic pattern from which you can design any style you like! Make the legs wide, narrow, or shaped (like boot cut or bell bottoms). Make any length you like. Add a shaped yoke or a stylized waistband. Or combine the pant with a bodice and make a jumpsuit! With illustrated instructions and over an hour of video demonstrating the steps, we'll take you through the process, step-by-step. Don't worry, we're there to help! 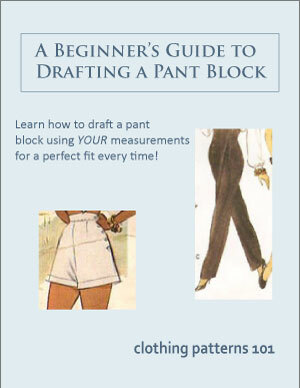 What's Included With the "Beginner's Guide to Drafting A Pant Block"? An introduction that tells you what you'll need to get started (and it's not much! Some paper, pencils, and a couple of specialty rulers are all you need). Illustrated, step-by-step instructions for drafting the front and back pant leg using your measurements. More than an hour of video demonstrating each of the steps. Using the videos in conjunction with the illustrated instructions make the process easy! The videos are available either online (on a password-protected page, for the digital version of the tutorial) or on the DVD. 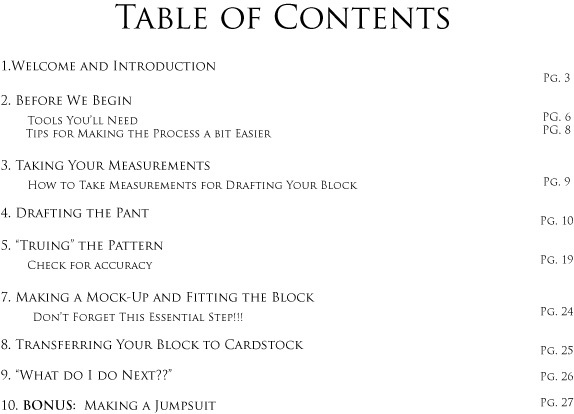 A bonus video showing you how to take the measurements you'll need to draft the block, along with a measurement sheet to record the information so you'll have it handy as you draft. Instructions for "truing" you pattern - how to ensure that the pieces fit together properly and that you've added grainlines and markings for easy cutting and stitching. A video on basic fitting techniques, to help you get the right fit, right from the start. Another bonus - a separate tutorial (with videos, of course!) showing you how to then use your dress bodice (or a commercial blouse pattern) to make a jumpsuit block. Jumpsuits are making a comeback! They're so easy to wear, and can be made to look like a blouse and pants, or a one-piece style. Sounds great. So How do I Order? Just make your choice between the downloadable version (with printable PDF files and online videos) or the DVD version (with PDFs and videos all on the disc). Take control of your closet and design pants you want to wear - pants that fit perfectly and look great! Purchase the Digital/Downloadable version of the tutorial. You'll have instant access to the pdf files (which you can download and print) and to the online videos on a password-protected page on Vimeo. The videos in this version are not downloadable. Internet access is required to view the videos.The pdf files arrive immediately via email. Purchase the DVD version of the tutorial. You'll receive all of the same material as the digital version of the tutorial, but in DVD format. This is the best option if your internet access isn't reliable or if you want a permanent, physical product. The videos are included on the DVD (viewable on your computer, not a DVD player), so internet access is not necessary to view the videos. (Shipping is $7 USD within the US, $25 USD to Canada, and $34 USD internationally) Package will ship from the US within 3 business days. Transit times depend upon final location. Sales tax will be applied to all purchases from the State of Wisconsin, USA.